We appreciate the importance of our clients knowing where their goods are at any time during the delivery process. Often there is a critical business aspect to a delivery - it needs to be there on time. The customer needs reassurance and peace of mind, safe in the knowledge that the consignment is in transit and their are no known issues. We understand that sometimes a bit of anxiety can creep in when deliveries are to be made. Which is why PC Howard Ltd offers an online line track and trace service so that our customers can identify where their goods are at any given time. Our online system is available from this website - simply click on the Track & Trace login by clicking on the client login floating button which is located on the top right of every single web page on our site. Of course, with our system being web based, not only does it give you the facility to find out where your goods are, but also the fact the that the system is accessible anywhere, whether it be in the office, at home or from a mobile device. Our system is provided by a third party operator and is a secure system so you will require a user name and password to access the Track and Trace Portal. Ask our booking team for more information and how you get access today. 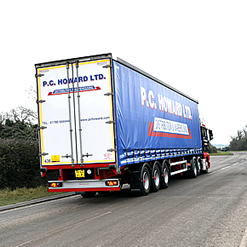 Call us today on +44 (0)1780 444444 and discover exactly how partnering with PC Howard will improve you supply chain.